Sometimes there are magicians who pretend to have magic, but are simply skilled at illusion. Other times there are magicians who have real magic but have to pretend they are just illusions. The Night Circus is spawned and one of the latter magicians audition for the illusionist job. She has been practicing and training all her life to face her competition. She does not yet know who they are, but they know who she is. They are playing a game that has rules not made clear to them. The circus and all the people involved are pawns, and sometimes sacrifices are made. The two competitors get in too deep, when they let their emotions get the better of them. Few people know of this hidden secret that the circus keeps, most are just dazzled by it's elegance and whimsy. Step inside a tent and perk up your ears to hear the story of Le Cirque des Rêves. What a wonderful story. I never wanted it to end. I took my time with this, devouring just one morsel at a time. The story plays out as if you were meandering around the circus. Lazy circles and flying between past and present until they intertwine. I loved all the characters in this, especially the twins Poppet and Widget. They were just a nice fresh feel in the circus and they just seemed like very fun, smart kids. 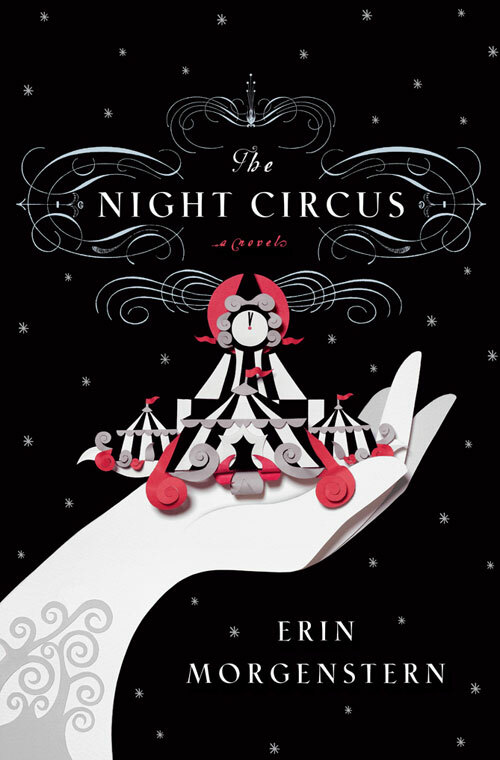 I adore the idea of a circus only open at night, especially one that is all black and white. Very fancy and gorgeous. This book doesn't necessarily have to be read too much in order. You could easily skip around within the first 300 pages and probably not be too lost. It would be a shame to read it that way the first time through though. The first time you should read it start to finish and then you'll probably want to pick it up again and explore the chapters in a different way. Each chapter is a black and white tent, with mystery and wonder inside dying to be explored. I recommend this to people who love magic and romance and mystery and a whimsical story. Celia takes on so much in this novel, and her father is a pain. I can't imagine having to put up with him. He and his friend do seem a bit too old to be playing the same game. Celia's father just seems very pompous and childish, after all the years he's been around, it seems like he simply has not grown up yet. Marco is charming. That's not all there is to him, but he certainly falls comfortably into his skin. The tents he invents for the circus are just amazing. I wish I could run away with this circus. They could hide me in a trunk, I wouldn't mind. All the characters were unique and unforgettable though, and they were just amazing people with great vision. The near ending sort of bothered me though, some of the last few chapters had that wrapping up the story feel to them, seemed a bit forced. It felt like there were things that we were supposed to garner from the book and the author wanted to make sure we got them. I did like the very ending though. It was prefect and almost how I thought it might end. A very lovely novel. I can not wait to read another novel by Erin Morgenstern because this one was simply awing. "The spreading moss is crushed by deep plum and sparkling gold as he pulls her away." I loved the twins - they were awesome! The twins were just simply fabulous! Great review. you really make me want to check this book out. I love the way you enjoyed the past and future coming together. You should definitely try it out, totally worth the read!